Remember when Damian Lillard drained that 3-pointer in 2014? You know, that 3-pointer to beat the Houston Rockets and move the Blazers into the second round of the playoffs? That’s when Joel Gunselman recognized the magic in Rip City. Shortly after, the 27-year-old lifelong fan from Lebanon created a social media campaign: “#DAME4MVP“. 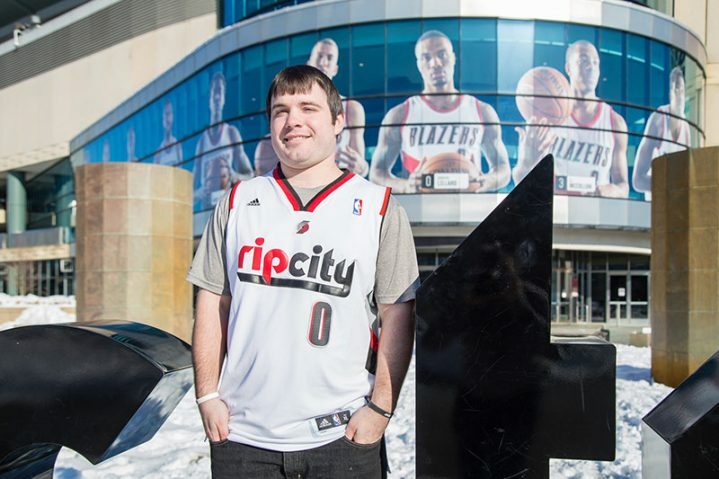 His Facebook page is creeping toward 9,000 fans, doubling over the past year, and he’s since added a Twitter handle (@Lillard_MVP) and Instagram page (@damianlillardmvp). Gunselman has brought on three volunteers to help manage the ever-growing accounts and his goal is to reach 10,000 fans by the end of the season. We spoke with Gunselman last week about the campaign and how he’s grown it over the past few years. How long have you been a Blazers fan? It all started in the early ’90s when my dad would take my siblings and I to a couple of games each season. Our seats were usually high up in the “nose bleeds” but that didn’t take away from the excitement. 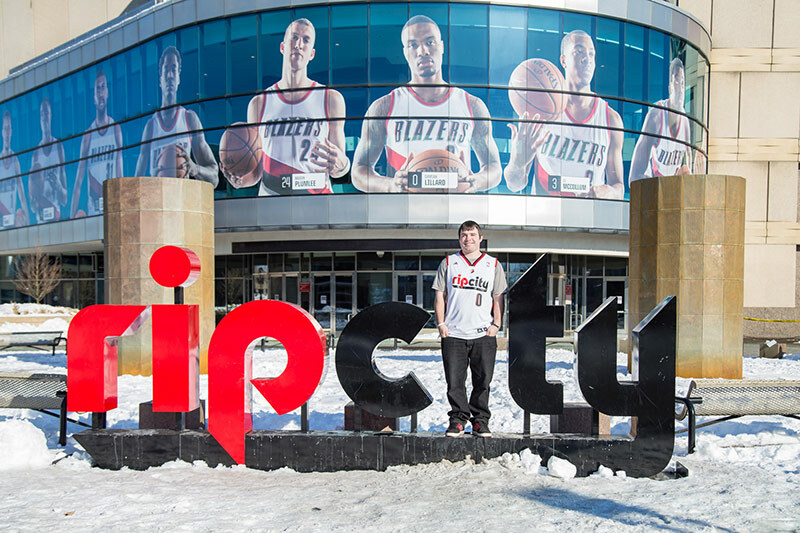 I immediately fell in love with Rip City. I haven’t heard from Dame personally about the campaign but I have had a few interactions on social media when sharing Lillard for MVP photos or commenting as the page. To make a long story short, he knows about it but I’m not exactly sure what he thinks. Any word from the Blazers? Except for an occasional Retweet, the Blazers organization has not been directly involved in the campaign. Being able to connect with them as the campaign continues to grow would be awesome. What are his chances this year? The struggles have definitely been frustrating at times, because I know what this team is capable of. However, good things take time to grow. I think losing two veterans from last year’s team and continuity issues while dealing with early season injuries have been the two biggest contributing factors. If the team finishes the season strong like last year and Lillard returns to his beginning of the season form, he will slowly but surely climb his way back up the MVP ladder. He may not win this year but the ultimate goal of this campaign is to stay behind it win or lose and build support for him, as well as every player who wears a Blazers jersey and Rip City as a whole. Besides seeing Lillard win the MVP, what else could make this campaign successful? Building fan support for a deserving player is the biggest goal. Playing in Oregon, Portland doesn’t exactly get guys a lot of national recognition. My goal is to get people who normally wouldn’t pay attention to the team to take notice. Things like this can really come in to play when it comes to All-Star voting. I also hope that this campaign can bring Blazers fans closer together through positive interactions on social media. What’s your favorite part of this whole campaign? Back in July, I came across a story that a woman named Erica Cassidy shared with a small Facebook group called Rip City Talk. It was about her son attending Damian Lillard’s basketball camp. He had attended the previous year and for his Birthday present, asked to attend again. By the time Erica was able to sign her son up, it was too late and the camp was full. She contacted Dame and he not only made room for her son to attend camp but he paid for him to attend as well. With her permission, I shared the story on Facebook and Twitter that night and it went viral. Less than 24 hours later, it had been seen by millions of people and stories had been picked up by OregonLive, KGW, Yahoo, Google, Bleacher Report, ESPN and too many well-known sports websites to name. I was glad to be able to play a part in sharing the story. Knowing that people around the world were able to find out about the type of person Damian Lillard is off the court was very exciting. There have been many fun moments but that one has definitely been my favorite so far! You can follow the campaign on Facebook, Twitter and Instagram. Check out his t-shirts and stickers here.